Maplewood Flats Conservation Area is a birding hotspot located in North Vancouver, BC just east of the Second Narrows Bridge. With over 311 acres of land including tidal marsh, forest, shoreline, mudflat and meadow habitats, the Park encompasses over three kilometres of trails. A later than normal start today Rob and I arrived at Maplewood at around 11am, continuing our ongoing search for spring migrants. Although we had heavy rain overnight the rain had cleared by the time we arrived producing an overcast but mild day. A quick visit to the office to familiarise ourselves with the reserve, and get the latest news, it wasn't long before we were off to investigate, especially as one of the species showing well was a Northern Goshawk. As we made our way to the reported Goshawk location a Hummingbird whizzed past Rob's head, but recognition was impossible due to it's speed, possibly Rufous. Northern Flicker were plentiful, and vocal, with at least a half dozen causing havoc, they always remind me of our own Green Woodpeckers back in the UK! As we made our way towards the salt marsh and our first look across Burrard Inlet, we'd pick up Downy Woodpecker and the usual Red-winged Blackbird, Spotted Towhee , Song Sparrow, Chickadees, Varied Thrush, Red-tailed Hawk, and both Ruby and Golden Crowned Kinglet. As we stood looking across the salt marsh we met one of the local birders, Les Lee and his mate Rob. I'd spoken to Les only online and he'd been extremely helpful regarding my many questions about BC birding, it was an amazing coincidence to actually meet up and I enjoyed our chat. 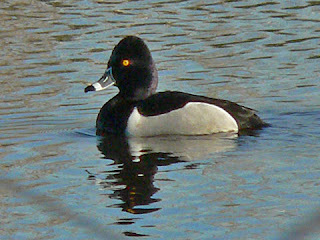 The West Pond had a male Ringed-necked Duck and Rob discovered an American Robin sitting on her nest. We had lunch overlooking the mudflats and this area had plenty of activity which included various numbers of: Northern Pintail, Greater Yellowlegs, Common Merganser, Pelagic Cormorant, Wigeon, Scaup, Bufflehead and Common Goldeneye. On the several pylons which reach out from the water two Bald Eagles were keeping vigil, but the surprise of the day was when the ducks scattered and an Otter suddenly appeared! We enjoyed watching the Otter antics for around 10 minutes before moving on, a most enjoyable lunch break. Three Purple Finch on the way back across to the salt marsh for a final half hour stint which produced of note: Barrow's Goldeneye, 3 Black Scoter, around 40 or so Surf Scoter and a single Pigeon Guillemot. 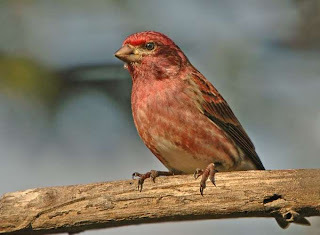 Before leaving we spent a while at the bird feeding station talking to another local birder called Quentin and managed Pine Siskin, American Goldfinch and House Finch. A very enjoyable day but due to the dull conditions no photography was possible!